The Safe Way To Store Your Iron. A Heat Resistant Pad With Pop Out Tool For Adding Water. Two useful laundry accessories in one! This is not just a silicone pad to rest your iron on. It also has a built in funnel for adding water too. The combination of these two features makes this product extremely useful and a perfect addition to any laundry room. It adds safety and convenience to the ironing process, allows you to pour in water without making a mess, and helps your iron to cool down quickly when you are finished. You will save time and aggravation while avoiding worry about hot irons tipping over when you use this advanced cooling pad. 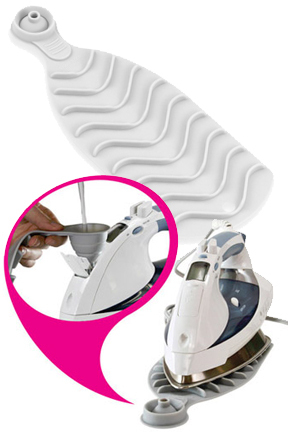 It is great for any iron, but thanks to the integrated funnel that collapses when not in use, it is ideal for steam irons specifically. Made entirely of high quality silicone, it is easy to clean, long lasting, slip resistant and able to handle temperatures up to 500 degrees. Use while you are ironing to give yourself two hands to work with, or use after you finish to ensure a safe resting place while your iron cools. As you are working, there will be many instances where you need to adjust a garment, switch to a new one, or just give your arm a break. This great pad allows you to rest your iron horizontally instead of upright, so it will be far more stable. You will not have to worry about wobbling boards, curious kids or pesky cords knocking over your hot tool because it will be sitting in a stable position when not in use. The material is not only resistant to heat, but also slip-proof. When your iron rests on the silicone surface it is actually gripped in place, and will never slip or slide by accident. The bottom side of the mat is completely flat so it will sit flush on any surface, and stay in place where you put it. The top side has a series of ridges that will elevate the metal and allow it to cool down faster due to increased air flow. The versatile material allows for placement almost anywhere, and because it is heat resistant all the way through, there is no risk to the material underneath. The integrated funnel adds tons of convenience to an already useful product. 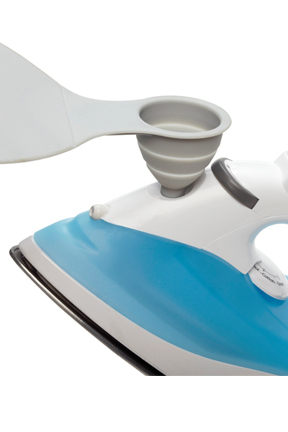 If you steam clothes as you iron, you will eventually need to refill the reservoir. This can be a messy and awkward process if you don't have the right tool. A funnel makes the job easy, but it is hard to have one handy in the laundry room. With the integrated funnel on this pad, you will always have one when you need it, and because it fully collapses when not in use, it won't get in your way when you don't need it. Simply pop it up to reveal the funnel, and then pop it down when you are done. It is the perfect size to fit right in your iron, and will make it easy to add water straight from the faucet, or poured out of a cup or other container. You will prevent spillage and make the task quicker and frustration-free. Locate an ideal spot for placement. It can be used on a traditional ironing board or in other places like the floor, a counter, on your dryer and more. Make sure to place on a flat surface that is hard. Set down with bumpy side up. Flat side will hug material underneath, and raised surface will elevate iron while still providing slip resistance. Use for short breaks while working, or use for storage and cooling after you finish. To use funnel, simply press down in the middle to pop it out. Once extended, insert small end into iron water reservoir and then add water to larger opening at the top. Collapse by pressing back in opposite direction. Stain resistant, but wipe clean if it gets dirty. Use integrated hole to hang when not in use, or leave out for convenience. Many of us do not have an ironing board to use, and therefore, no safe place to rest the iron when it is hot. Even for those of us with a board, this pad will add convenience and protection. By slapping it down, you can safely rest your hot iron on a tabletop, counter, floor or storage area. This will allow you to do the job anywhere and be safe at the same time. It will protect any surface from heat, and make any possible accidents way less likely. The silicone material is stain resistant and easy to clean, and it has a built in hole to make it easy to hang for storage. You can even toss it in the dishwasher for cleaning for added convenience if it gets dirty. Make the job safer, easier and less time consuming with this great laundry accessory. 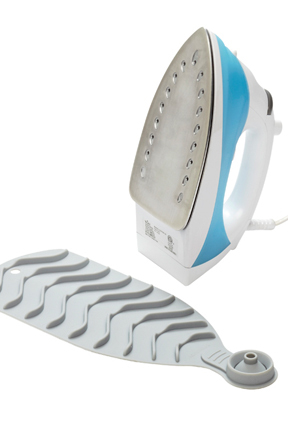 Your iron will be safer and more stable when in use, it will cool down faster after you are done, and adding water for steam will be easier than ever and without a single drip spilled. Order Yours Today! Dimensions 13.25" x 5.25" x .5"
Uses For use as a resting place when working or a cooling or storage pad when not in use. A silicone pad to safely rest your iron on when it is hot. Allows for horizontal placement at all times. The integrated funnel is collapsible and makes it easy to add more water. Order Yours Today! Portable Ironing Mat - Get a use anywhere mat and iron rest in one. Natural Rubber Pads To Prevent Movement & Noise. Remove debris from lint traps, exhaust hoses, and other areas with ease. Compact And Powerful. Works In Less Than Three Minutes. A low cost fabric softener that also makes clothes smell naturally fresh without any harsh chemicals.